An Australian company wants to pioneer a new way of getting energy from the sun. 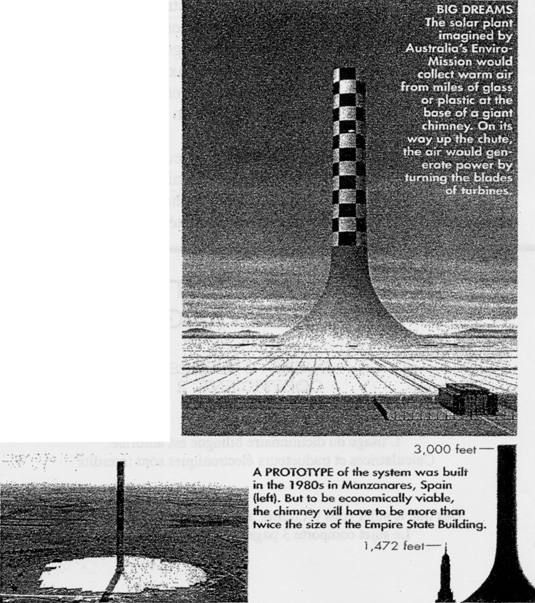 All it needs to do is to build the tallest man-made structure in history - a 3,000-foot concrete chimney - in the outback. Solar panels typically convert solar energy directly into electricity. But the facility planned by Melbourne-based EnviroMission would use heated air to power turbines that supply the electricity. The hot air would come from 7,5 square miles of glass or plastic around the chimney's base - a giant greenhouse. As the air warmed, it would rise toward the chimney. The result: a continuous flow that, on its way up, would spin the turbines' propellers. The Company estimates that the suction would create a 35-mph updraft that could power 32 turbines, generating up to 200 megawatts of electricity, or enough to supply 200,000 homes. The plant would keep working at night by a system of tubes filled with warm water. These tubes, heated by sunlight during the day, would continue to heat the air under the glass after dark and keep the power plant working. The concept was tried over seven years in a much smaller prototype in Spain. But to be truly efficient, its designers say, scale is of the essence. A 3,000-foot tower wouldn't come cheap: the giant structure will cost an estimated $670 million. The company argues that an expected life span of 100 years, combined with low maintenance costs and the absence of pollutants, will make the endeavour worthwhile. The Australian government is expected to OK the construction, but so far has offered no money.